My sister asked me the other day the meaning of the deer as a sign?? Well perhaps I take the deer as a sign for granted. Most likely because I see them so often and sometimes I even hit them...frown.. But possibly that's a sign I've been ignoring..Maybe they keep popping up for a reason?? I especially like the part below where it talks about going on a visualization hike with the deer! Oh where or where will it lead me?? When we encounter the deer in the wild, our breath catches - we are transfixed by their graceful features and delicate movements. The tender beauty of these beasts has not gone unnoticed by our ancestors. The deer is linked to the arts, specifically poetry and music in ancient Celtic animal lore due to its graceful form. The Celts also believed that deer were associated with the fairie realm, and would lead troops of fairies - hundreds of them trailing behind them as the stag cut a path through the forest. Both Celts and Native Americans observed the deer to be savvy when it came to finding the best herbs. These earth-bound peoples would follow the deer to prime herb patches - many of which proved to be highly beneficial in their medicinal purposes. How does this translate into our own life experience? Those wishing to invoke the symbolic meaning of the deer may have most success and profound experiences while incorporating these associations. For example, we can honor the deer during a full moon to enhance or draw out some of the deer's qualities (listed above) within ourselves. 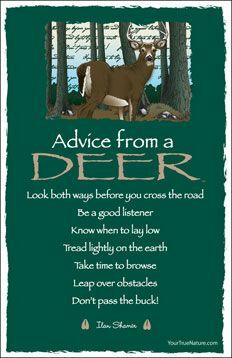 Likewise, honoring the deer with our attention pointed in an eastern direction at dawn will elicit responsive energy too. Nothing fancy (the deer really has no use for pomp and circumsance - her pleasure comes from quiet simplicities) just a solemn nod of your head and a simple "thank you" for deer's presence will do.